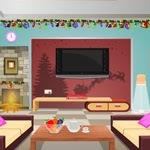 Christmas Room Escape is new point & click room escape game. After having a great time on Christmas Eve, you got trapped inside a Christmas room. In order to go out from this trap, you have to find useful objects to solve puzzles and unlock the door to escape. Good luck!